3,588 2 | Thảo luận trong 'Review - Preview' bắt đầu bởi HuyTran, 7/3/17. NieR Automata is the ultimate JRPG, mixing perfectly this genre with the Hack n’ Slash style. It succeeds in every aspect: A complex and deep story, beautiful design and a unique style. This game is a true masterpiece. NieR: Automata is the rare gaming experience in which narrative, aesthetics, and gameplay all complement each other to form a perfect storm of master class game design. A truly exemplary example of what video games are capable of as an art form, and a new personal favorite. NieR: Automata is nearly as good of an RPG as it is an action game, which is a mighty tall order. It's tough to really strike that balance as many action-RPGs tend to favor one element over the other, but Platinum Games, with the help of Square Enix, has tapped into its innate ability to captivate us with combat while keeping the rest of the journey engaging. Put simply, NieR: Automata is the greatest game ever made. 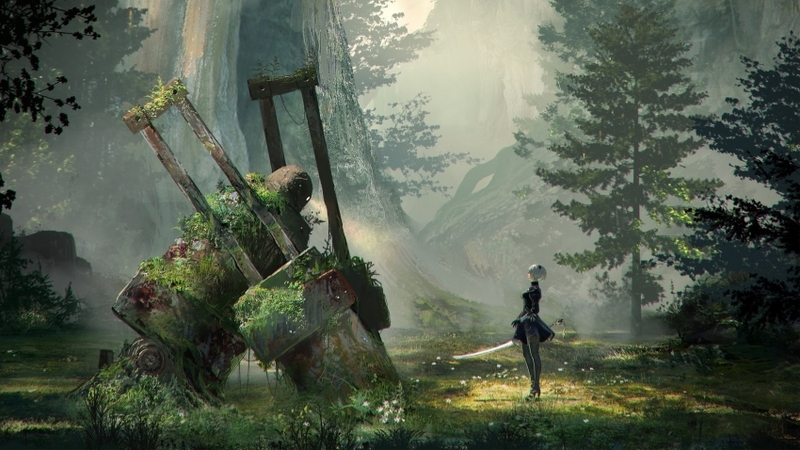 It's not just that it is the deepest and most narratively potent game ever developed - and it is a truly deep narrative experience - but more than that, Yoko Taro has finally found perhaps the developer on the planet capable of doing his visionary work justice. While Nier: Automata at times feels unpolished or under-developed, when taken as an entire experience, it's a fantastic journey of a group of androids struggling to live up to their purpose in life. Here, unconventional narrative design meets tightly-developed combat gameplay, and that turns out to be one heck of a combination. By genre, you could say that Nier: Automata is an action role-playing game. But the reality is that it's a whole lot more. Hands down, one of the smartest action titles Platinum Games has ever put out, with a rousing score and some of the best narrative ideas I’ve seen in a videogame. NieR: Automata is an absolute masterpiece from beginning to end (or ends, to be a bit more accurate). Nier: Automata is one of the most original, surprising and brilliant games of this generation. Not perfect, but unmissable. NieR: Automate it's one of the best action games of the last few years, and a complete tribute to the video games industry. I’m going to hold off on giving it a final score until I’ve seen just how weird things can get in the many alternate routes, but NieR: Automata gets a huge thumbs up. Seeing the first real ending of the game only took me around ten hours, but they were ten unforgettable hours that were stuffed with set pieces and emotional scenes. Yoko Taro’s wild ideas and Platinum’s workmanlike approach to action game design are a match made in heaven. After a couple of mediocre titles, Platinum Games are back – and they're better than ever. Nier: Automata is an almost perfect action game, with an interesting story and fluid gameplay. A must have for anyone that looking for a challenging action game. Exceptional in every way. NeiR: Automata delivers on every cylinder, providing one of the best experiences this year. In every generation there is a game that leaves an impression on you and for me NieR: Automata is that game. To put it simply, NeiR: Automata is a magical experience. A role playing game rich in unique characters and a multilayered story waiting to be unraveled, with one of the fastest and slickest fighting system in a game of its kind, against a diverse cast of bosses. All of this in addition to this year’s best and most unique soundtrack, and this uniqueness extends to the gameplay and quest designs, all with the patented Yoko Taro touch. Its only let down by an unbalanced difficulty that robs many boss fights of their grandeur, and the sparseness of its world. As a game with multiple endings, we're not quite ready to give our final score, but right now it's looking like a big success for Yoko Taro and his team that'll please fans of the original and those of Platinum's action-orientated output, approaching the genre-leading Bayonetta 2 for the sheer joyous carnage 2B is capable of wreaking. Automata may not be for everyone, but if you're ready to dive deep in it, you might just find something really worth the effort after all. Despite some minor annoyances, NieR: Automata is brilliant. It strikes the balance between RPG and action game unlike anything else in the genre. It’s a game you kind of have to meet halfway, with a story that gets more complex and interesting the more you prod at it. If you’re willing to commit, though, you’ll be rewarded. Nier: Automata dares to center its tale on something more sentimental: two androids wrestling with their small connection to humanity, and what that means for them.